Looking to rescue a dog? Adopting a dog is a great way to find your new best friend and save a dog’s life. In this article we’ll explore everything you’ll need to know when it comes to adopting a dog. There is quite a bit of preparation you’ll need to do ahead of time before adopting your new dog. First and foremost, you’ll need to determine what kind of dog you’re looking for. Take your time when making this decision. Even though there are many cute and wonderful dogs in the shelters you shouldn’t be hasty in this part of the process. While you may not have the complete selection of breeds available to you, you’ll need to consider things like the size of dog, its temperament and its energy levels. If you’re looking for a shelter or pound close to your home or work, do a search on google for “dog rescue near me” to get an idea of what’s close to you. You’ll want to adopt a dog that is similar to you in personality. Determine where in your household you’ll keep your dog for the first few days as they adjust to your new home. The kitchen is usually a good place as it allows for easy clean up and is away from any items around the house which they could break or destroy. Of course, make sure they aren’t near the kitchen when you’re cooking to prevent any accidents. You also want to make sure that you have enough room in your home and the financial resources to accommodate your new dog. Are you going to have enough time to take it on frequent walks or to the bathroom? Your dog’s teeth will likely need to be brushed several times per week and it’s nails clipped. Don’t forget grooming! Do you have anyone else that lives in the home like small children, roommates or family. It’s important to ensure that everyone in the household is 100% in agreement and on board when bringing a pet into the home. Caring for your new dog will likely be a family effort so this is very important. You’ll also want to consider nutritional requirements, basics such as food, leashes, toys, ID tags, a crate or small furniture for it to lay on and sleep in. You’ll need to find a local vet a likely get a checkup to ensure your pet is healthy. During the first checkup you’ll likely get a glimpse into your dog’s past history, current health status and personality. Don’t be afraid to ask the vet questions because this is going to be your new pal for quite a while! 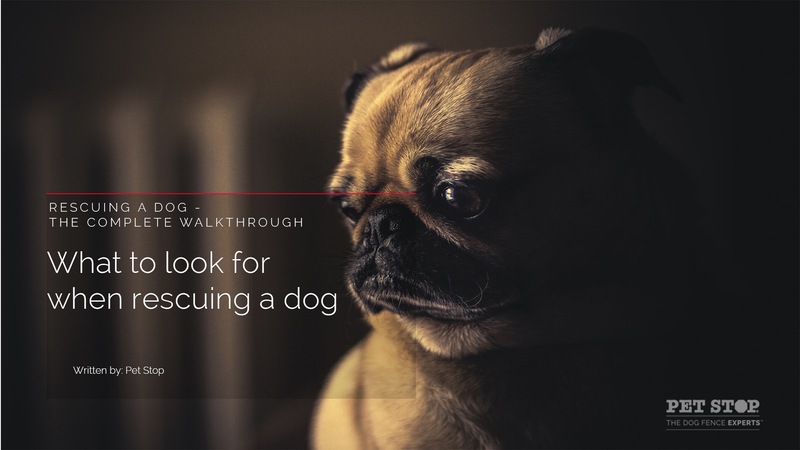 Getting your dog tagged right away is important and you’ll also want to consider microchipping them to ensure you can always keep track of their location. You’ll also want to consult with your vet about getting your new pup spayed or neutered. Every year 6-8 million animals in the US are left at animal shelters and a major cause of this is the rising population of unintended puppies being born. Save an animal’s life and consider this crucial step! 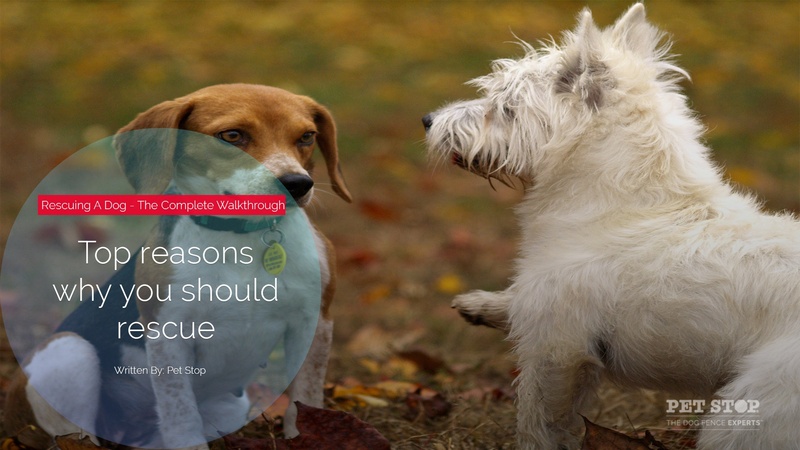 Now that we’ve covered some important preparation tips you need to consider before adopting a rescue dog, let’s consider the reasons why you should consider dog adoption. As we mentioned before a huge number of dogs are euthanized in the United States, simply because there are too many pets coming into shelters and too few people considering dog rescue as an option. If more people considered dog rescue an option, we’d save the lives of many of our beloved furry friends. Not to mention, adopting will cost you much less than buying straight from a breeder. Often times the cost of a spay/neuter, vaccination and sometimes even microchipping will be included in the adoption price. Depending on the past experience of the dog you may even save on training expenses. Often times if you buy a dog from a pet store, online or flea market you’re going to be getting a dog from a puppy mill. Puppy mills are factory style breeding facilities that put profits above the welfare of the dogs they product. Unfortunately, these puppy mills don’t take proper care of their animals and are raised in poor conditions with improper medical care which leaves them sick and troubled. In addition, the moms of these puppies are left in cages to be bred with over and over for years without ever having ability to be with their young or ever finding a good family. It’s not all sunshine and rainbows at your local pet store. This is another reason you should seriously consider rescuing a dog! While these guidelines aren’t perfect, they’re a framework you can start with. To start, you’ll want to look for a dog that is friendly. A friendly dog wiggles and wags her tail when they see you coming. He or she may press up against the kennel to try and get as close to you as they can. If he happens to bark, it’s an excited noise that sounds happy, not deep from his chest as they would with anger. His wags are also soft and loose not rigid and high. While behaviors can provide good indication, they are limited in their total information. Your next best option is to enlist a trainer to help you. The Certification Council of Professional Dog Trainers is a good place to start. These individuals typically have a background or experience working in a shelter and have had some sort of formal training in behavior analysis. While it might not seem counter intuitive to spend more money to hire a trainer if you’re budget conscious, it will save you considerable headache in the future. Their temperament or mood. Do they get excited easy and do they calm down easy? It’s important to asses these things with a professional to prevent any unwanted accidents or inconveniences down the line. Another recommended resource is the book Successful Dog Adoption by Sue Sternberg which you can pick up a copy of here. Whether you’re buying a puppy from a shop, breeder or adopting one, starting training early on is key to ensuring good behavior and setting proper boundaries. Training starts with choosing a great name for your new puppy. Consider a short name with a strong ending and a strong consonant. THis allows you to say his name and always say it clearly. A strong ending like Jasper, Jack and Ginger perks up puppy ears. If the dog is older, it might be harder to change their name, however it’s never out of the question. If they’re coming out of an abusive household, it might be a good idea to change their name to give them a fresh start. Use the name consistently with training and soon they will begin to respond. Always associate your dog’s name with positivity and fun things. Your dog’s greatest training and learning will come from positive reinforcement. Commands such as come, sit and stay are crucial to your dog’s foundation and training experience We discuss and dive into advanced training tips in a separate article (link here) which you can learn explore. Always remember that when it comes to training, you want to reward good behavior and always use positive affirmations. While you’re dog doesn’t understand english, they pick up on our tone of voice, body language, enthusiasm and energy levels. You’ll also want to set some ground rules around the house. For example, do you want to make sure they stay out of certain areas in the house, bedroom or keep off furniture? You’re dog will do a fair amount of exploring when they get to their new home so you’ll want to ensure that you always watch them and ensure they don’t get into place they aren’t supposed to be. It’s good to allocate a certain aspect of the house and make it their own so they feel comfortable and safe to always go there, whether they want to relax or even go to sleep. 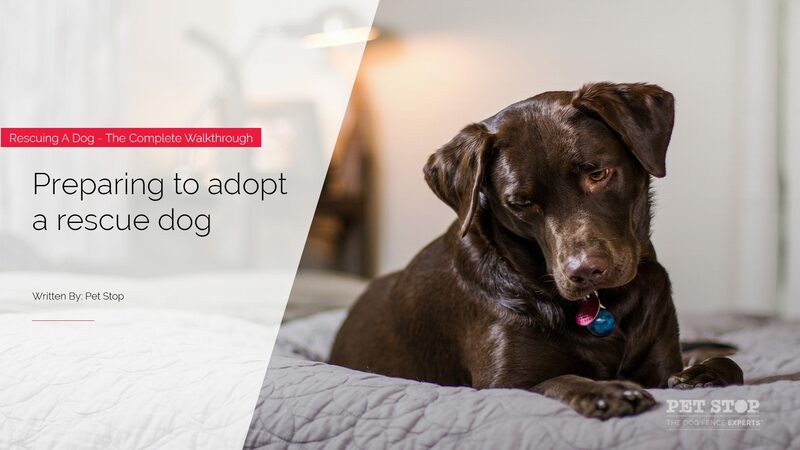 Building a good relationship that’s based on trust and love with your newly adopted rescue dog is key to maintaining a good relationship and allowing them to become positively associated with your new home. Having come from a loud and typically unloving rescue shelter they could be nervous, anxious and uneasy settling into your new home. They’re integrating into a new and strange place with strange smells and new faces, so it’s important to maintain some space and provide a comfortable zone for them to get acquainted. To start, she needs a place to call her own so set up their bed or crate in a quiet, low traffic part of the home so they always have a safe place to go and relax or wind down. This next step might seem difficult, but it’s important. Ignore them, give them the space they need to get acquainted. This is not to say to ignore them completely even if they approach you. You just need to allow them to integrate into the new space on their own. If you’re overbearing too early on, they may get uneasy, especially if they came from an abusive or difficult home. Speak softly and keep the volume of electronics generally low. Let them approach you and become acclimated to the new environment and faces. Don’t be disappointed if this all doesn’t happen immediately. Have treats on hand and always be positive. The key to inducing positive behavior is through positive reinforcement. Gentle praise for what they do right and rewards with treats is a great way of getting them to behave in proper manners. Another way to build trust with your new dog is to get on their level. Kneel down or even lay down. This allows them to see you as smaller and less threatening. Adopting a rescue dog can be an incredibly rewarding experience! We hope this article’s given you the insight, knowhow and knowledge to be better prepared and ready to find the perfect new pup to call family. We want to know if you’ve rescued a dog! In the comments section below tell us about your experience, what steps you took and how you helped your new fido become part of the family. Share any tips, insights and strategies you have for people who are looking to adopt a new dog.